Nothing says summer like a piece of grilled fish for dinner. But that’s just so boring…and boring is not something I like to surround myself with in the kitchen. I like big flavors with bursts of texture and lots of herbs. Grilled salmon was on the menu and we wondered how we could “dress it up” a bit. Salsas and sauces were scratched off our list and then David mentioned tzatziki sauce. We really like Greek food because it is loaded with flavor featuring healthy and mostly plant-based ingredients, so tzatziki sauce was the winner. 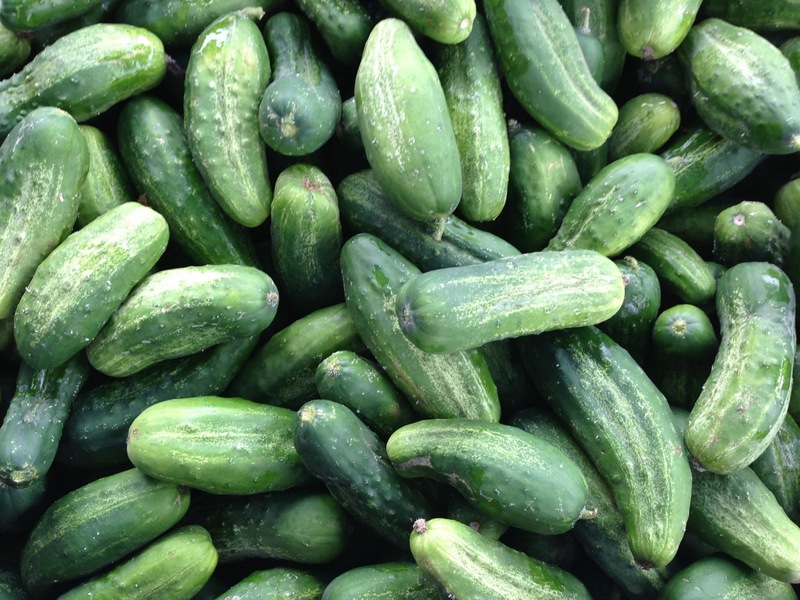 Plus, I remembered that I had some of these beautiful pickling cucumbers from the farmers market ready for action. It was a year and a half ago when we made an avocado-tzatziki sauce with grilled salmon. Light and so refreshing, this is in the same vein but much more authentic. This tzatziki is so thick and delicious, I admit I did some “quality control” sampling with cucumber spears and a purple haze carrot. It would also pair well with grilled lamb. So dust off the grill and let’s get summer started with great flavors and fresh herbs. Use this deliciously summer sauce for grilled fish, lamb or just as a dip for raw veggies. It is also an ideal accompaniment to falafel. Place cheesecloth in a colander and then place the colander in a bigger bowl. Place the yogurt in the cheesecloth-lined colander and let sit in the refrigerator for 2-3 hours so the whey drains. You will collect about 1/4-1/3 cup whey and what remains will be unbelievably thick and rich. In a food processor, pulse the coarsely chopped cucumbers and garlic until you get the desired texture you want. I pulsed mine so they weren't in big chunks or pureed, but somewhere in between. Take an old, thin dishcloth and place the cucumber-garlic mixture in the center. Pull the ends up and, over the sink, squeeze and squeeze and squeeze some more. You will be amazed at the amount of water that comes out. When no more liquid is released, put this mixture in a mixing bowl. Add the olive oil, vinegar, dill and salt and stir well to combine. Then add the thick yogurt and mix well. Taste the tzatziki and add a little more vinegar, salt or dill. Serve cold and garnish with more dill, a pinch of Maldon salt and freshly ground black pepper. Store any leftover in the fridge.